Shortly, after my daughter started kindergarten, she had her first every after-school emotional meltdown, and while temper tantrums certainly weren’t something new to me by that point in our lives, I remember feeling like was at a loss. She seemed so happy when she saw me when I picked her up that afternoon, but when I got to the grocery store parking lot, instead of driving straight home, all hell broke loose. I soon realized that the grocery store is the last place a child wants to be after a long day at school, and while I initially blamed her outburst on my poor meal planning skills, that wasn’t the last after-school meltdown she threw. Thankfully, I had many friends who were moms of school-age children and when I turned to them for advice for the after-school meltdown that started to take over our afternoons a few weeks later, they were quick to tell me that it was 100% normal. As it turns out, most kids experience an after-school emotional meltdown at some point in their school career and after talking and researching it, and then experimenting with different strategies for my daughter, I’m happy to say after-school meltdowns are (mostly) a thing of the past. 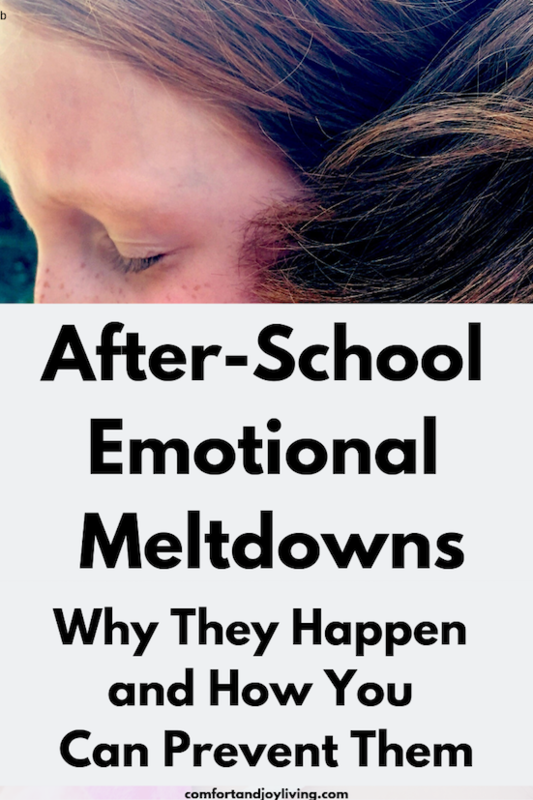 What is an After-School Emotional Meltdown? While there’s no textbook definition of what an after-school emotional meltdown looks like, they’re pretty easy to spot once you’ve experienced a few. You child may be more moody than usual, they may seem irritable and cranky, and you may notice them crying over seemingly inconsequential things. Keep in mind that each child has a unique way of displaying their feelings, an while some kids become whiny and clingy and benefit from hugs and snuggles, others may become defiant and explosive and require some alone time before they’re able to calm down. Why Your Child is Overwhelmed After School? Before we start to discuss strategies to minimize the possibility of your child having after-school emotional meltdowns, let’s discuss why they happen in the first place so that you can identify triggers and put together a plan to help your child regulate their emotions when they’re feeling out of sorts. Exhaustion. Not only are children physically exhausted after a long day at school, but they are mentally exhausted too, making it difficult for them to focus on homework, extracurricular activities and/or household chores. Please also note that the beginning of a new school year can be extremely overwhelming for kids, especially if they’ve been lounging around the house watching TV all summer and have gotten used to a later bedtime. Try changing your child’s sleep schedule routine two weeks before the first day of school to ensure that they’re well-rested and ready for the transition. School anxiety. If your child struggles with school refusal and separation anxiety, her after-school meltdowns may be triggered by the fact that she’s been trying to keep her emotions and worries in check all day. Don’t take her after-school meltdowns personally and instead see the for what they are: a release of all the feelings they’ve kept bottled up all day. Remember that you are their safe place and instead of focusing on diffusing them after their tantrums, get to the root of the anxiety instead. Overstimulation. Whether you have a young child who is just transitioning to school and/or a child that has sensory sensitivities remember that school can be extremely overstimulating. Classrooms are loud and bright and there are a lot of different activities going on simultaneously, which can quickly lead to sensory overload for some kids. Lack of movement. Kids love to move around a lot and if you have a child who is very active, sitting at a desk for hours at a time may be excruciating for them, and their explosive behavior at the end of the day may simply be the result of their need to release their pent up energy. Transitions. One of my teacher friends told me that her kindergarten classroom can have up to 12 different transitions throughout the day. And while some kids can go from one activity to another with no problem, others struggle with this, making them feel frustrated and irritable by the end of the day. Rules. There are many different rules that kids are required to follow throughout the school day, and with 30 or more kids in a classroom, teachers are often pretty strict wen it comes to enforcing these rules. This can be very frustrating for kids, especially when they’re used to getting their way with mom and dad, and this may trigger them to lash out and push boundaries a bit more when they get home at the end of the day. Bullying. If you notice that your child is suddenly trying to get out of going to school, and/or they seem more withdrawn or distant at the end of the school day than they used to be, don’t discount the idea that they be having challenges with one or more of the kids in their class. To help you access what triggers an after-school emotional meltdowns in your child, I suggest tracking their behavior over the course of a few weeks using an Antecedent-Behavior-Consequence Chart, or ABC Chart, which is really easy to use, and incredibly helpful in determining the root cause of challenging behaviors. Consequence: What happened after the behavior to either encourage/deter a repeat of the situation. The idea is to track the same behavior—in this case, your child’s after-school meltdown—several times to determine if there are any consistencies, and then formulate a plan to change the antecedent and/or consequence to help prevent your child from having meltdowns. You can also use this tool to determine if the antecedent and/or consequence is out of your child’s control (i.e. sensory sensitivities) or if your child is just being a kid and acting out. Now that we’ve identified a list of possible reasons why your child may be prone to having after-school meltdowns, let’s discuss different strategies that you can use to help prevent them from happening in the first place. 1. Make sure your child is getting enough sleep. If your child has after school meltdowns, one of the first things that I would suggest doing is evaluating their sleep schedule. If you need to wake your child up in the mornings and/or you find them feeling groggy and irritable when they first get out of bed, you may consider an earlier bedtime. This is especially important at the beginning of a new school year when kids are transitioning from lazy summer days to demanding school schedule. Like I suggested above, it would be highly beneficial to change your child’s sleep schedule routine two weeks before the first day of school. 2. Bring a snack when you pick your child up. After my daughter’s first after school emotional meltdown. I reached out to my mom friends for advice about some quick fixes and a lot of them swore that their child’s after school tantrums have always been triggered by hunger. Once I started this, I consistently found that my daughter is much better at regulating her emotions after school when she’s not “hangry”. I try to keep non-perishable snacks in my purse, and on days that I don’t have time—or forget—to grab something before picking her up, I suggest a mom-and-me date at a local shop so she can get a treat. 3. Give your child a comfort item. My daughter has struggled with various levels of school anxiety at different stages throughout the past few years, and one thing that I’ve found extremely helpful is letting her take a comfort item with her to school every day. We’ve tried many different ideas, and the one thing that has worked the best is a “take away your worries bracelet.” My daughter puts her bracelet on every morning before school, and whenever she feels anxious, she simply rubs the bracelet and sends the worries my way so I can fret over them for her. I came up with this idea before she started school last year and it’s made such a huge impact on her ability to cope with her worries when I’m not with her. Give it a try! 4. Avoid running errands after school. As tempting as it is to go to the grocery store, fill up the car with gas, stop at the ATM machine, and get other tasks done, I recommend that save these errands for a different time. Remember that your child is tired and is need for some downtime after a long day of sitting still, following rules, and trying to keep their emotions in check. Try to instead organize your day in which you run errands while your child is at school or in bed for the evening. And on the days that this isn’t possible, save your errands until after dinner when your child has been fed and has had a chance to unwind. 5. Listen to what your child needs. While some kids may need to run off some steam at the end of a long day at school, others may crave time alone. Figure out what works for your child and make it a part of their daily routine. If your child needs an outlet for all the energy that they’ve kept bottled up all day, go to the park or enroll them in their favorite sports program after school. If they prefer some downtime, go straight home and set them up with a snack and their favorite book or TV show. 6. Choose extracurricular activities wisely. We live in a world where we’re encouraged to over-schedule ourselves and our kids. And while extracurricular activities are a great way for our kids to focus on things that they’re passionate about while also cultivating friendships outside of school, remember to use your best judgement before making commitments. If you find that your child’s after school meltdowns are triggered by their inability to sit still all day, enrolling them in extracurricular activities may help them blow off some steam before going home to do homework. On the flip side, if you find that your child is tired, moody, and cranky when you pick them up at school, it may be best to avoid after school activities completely, or organize them for weekends instead. 7. Be clear and consistent. If your child is used to getting her own way at home and you notice them struggling to keep up with all the rules that are imposed on them at school every day, it may be time for some tough love. Ask your child’s teachers for examples of the rules that your child struggles with the most throughout the day, and start enforcing them at home to ensure greater continuity. Be clear about your expectations, provide reminders, and remember that the key to good behavior is consistency. 8. Make sure to have quality time. Set aside at least fifteen or more minutes with your child each evening to spend uninterrupted, quality time together. Turn off your laptop, silence your phone, and give 100% of yourself to your child so that they don’t feel the need to act out in order to get your attention. This doesn’t need to be complicated—it just needs to be deliberate. Whether your child has an occasional after school emotional meltdown, or struggles to regulate their emotions every day, remember that it’s normal. You child is allowed to feel overwhelmed and simply lacks the ability to express their feelings in a more appropriate way. Instead of blaming yourself and your parenting skills, try to get to the root of the issue and find ways to be more proactive instead of reactive to make after school meltdowns more manageable for everyone. Do you have any tips to help prevent your child from having after-school meltdowns?